Bankers must increase their attention on consumer safety after a new electronic payment system is being developed, according to CFPB Director Richard Cordray. Existing laws and rules won’t be enough to protect consumers. Banking activity needs to be monitored consistently with laws and regulations in mind to actually allow the rules to take the intended effect. Considering the demands of tackling guidelines and ensuring compliance, banks should prioritize managing supplier risk at the top of their list. 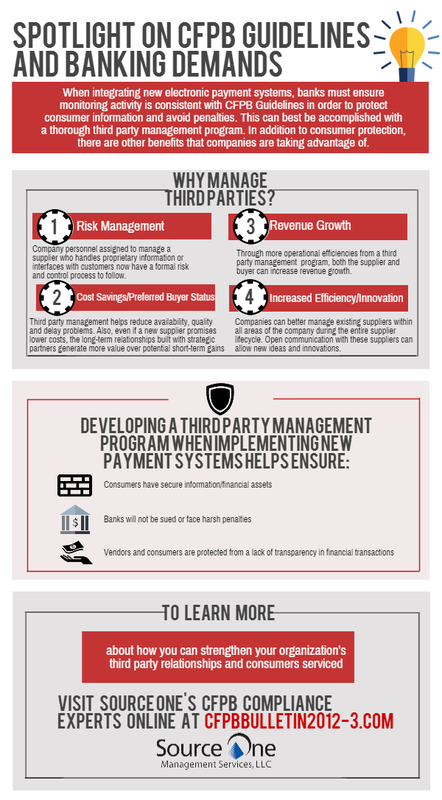 Even if banks have their own operations in compliance, they must also be compliant through their third party associations—this is where third party management comes in. In addition to the likelihood of cost savings from reduction of quality issues, a solid third party management program will provide a plan for formal risk and control processes within supplier relationships. To learn more about how you can strengthen your organization’s supplier relationships and consumers serviced, reference the infographic below and visit our webpage to see how Source One’s SRM experts are unmatched.